This Color Identification Record Sheet can be used to keep track of an individual student's color recognition progress throughout the school year. The first row in the grid is for the pretest, and the following rows can be used to check the child's progress each grading quarter. This is an excellent document to add to a portfolio or use at parent conferences to display a student's progress. 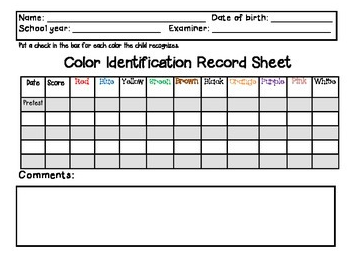 If you like this Color Identification Record Sheet, you may also be interested in my Preschool Assessment Record Forms.